I am making a short film adaptation of a story from Sir Arthur Conan Doyle's 2nd most famous series "Professor Challenger." The Challenger books were sci-fi/fantasy books set in the late Victorian/early Edwardian era. One of the most famous books of the series "The Lost World" would serve as the inspiration for Jurassic Park. The film will go out on Youtube as well as the popular Sherlock Holmes/Sir Arthur Conan Doyle website - No Place Like Holmes. 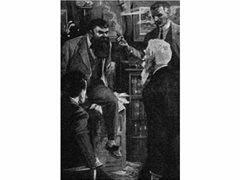 It will likely prove to be interest to fans of both Challenger and/or Sir Arthur Conan Doyle. Also, to a lesser extent, Sherlock Holmes fans. This film will also serve as an appendices piece for the 8th No Place Like Holmes web series, with small elements of the events being referred to. You will receive an IMDb credit, your site of choice will be promoted on both the NPLH website and Youtube video, and you will be permitted to use the footage elsewhere should you wish. Also, bear in mind that the website has great outreach, so this is something that many people could see you in. I, of course, will give you a very glowing recommendation too. I also offer free editing of showreels to any actors that may need it. SUNDAY 24th FEB. Needed for Approx 2 hours. I am looking for two European actors for 1 short scene in which they will portray Ambassadors of their country excitedly discussing a deal they have struck for their country. The core dialogue, jist, and directions will be given, but the actors will ad-lib an approximation of this within their native language.